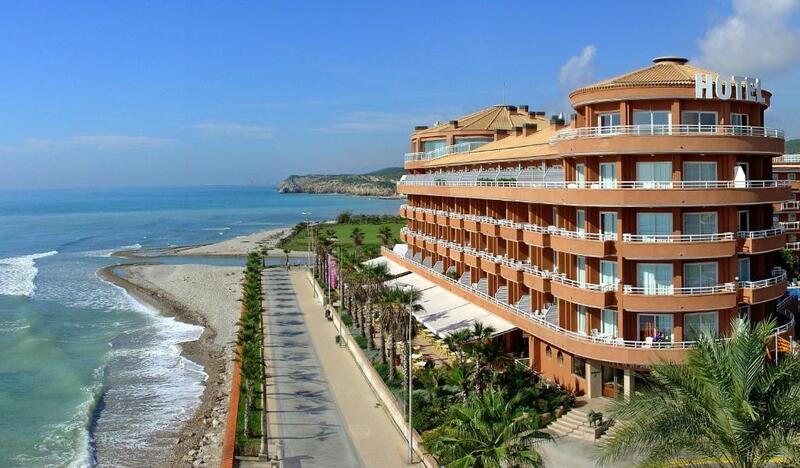 Lock in a great price for Sunway Playa Golf & Spa Sitges – rated 8.7 by recent guests! Loved this hotel! Wish we would have been staying more than one night. Room was huge, bathroom was beautiful and both were spotless. And the private patio with the ocean view...wow! Staff was friendly/helpful, food was excellent and the free bikes offered by the hotel were an added bonus. It is in a very quiet location which allowed us to sleep with the window open to enjoy the sound of the ocean without other noise all night long. Slept like babies! 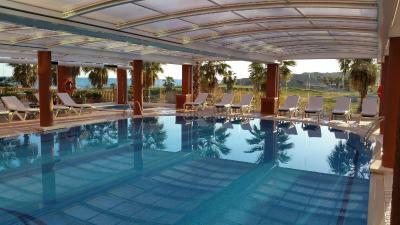 Beautiful place, pools, Jacuzzis and open air bar on the Mediterranian sea. Great staff. Breakfasts were fantistic! Great location in front of the ocean. Beautiful room. Price was somewhat high for the junior suite and obtaining parking outside was challenging,. Other than that, wonderful. Great hotel. Some children there but a real air of calmness everywhere. Breakfast was very good. StFf were very helpful. Our room (family suite) was great. Additional Kitchenette was very useful with children too. The view, facilities, and the free bike rental were great. Beautiful inside and out. Fabulous views. 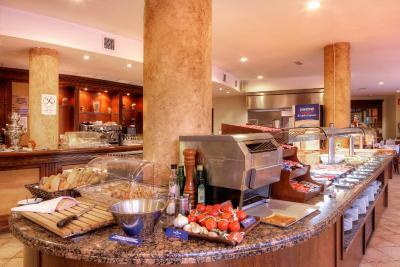 Delicious breakfast buffet with endless choices. Wish we could have stayed longer. 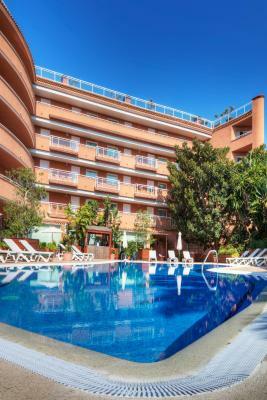 Sunway Playa Golf & Spa Sitges This rating is a reflection of how the property compares to the industry standard when it comes to price, facilities and services available. It's based on a self-evaluation by the property. Use this rating to help choose your stay! 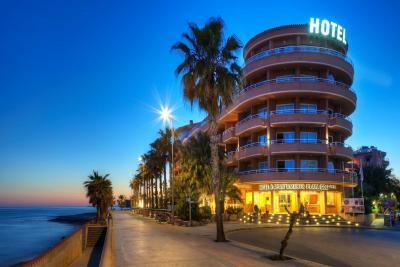 One of our top picks in Sitges.This hotel is just 50 feet from Sitges Beach and next to Terramar Golf Course. It offers free bicycle rental, 2 pools and accommodations with free Wi-Fi, private balconies and fantastic views. 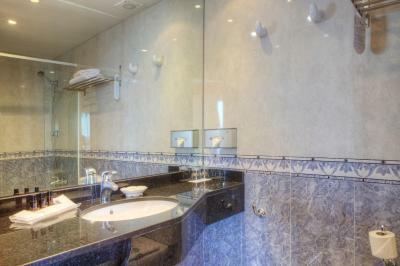 All of the air-conditioned rooms in Playa Golf and SPA have tiled floors and satellite TV. 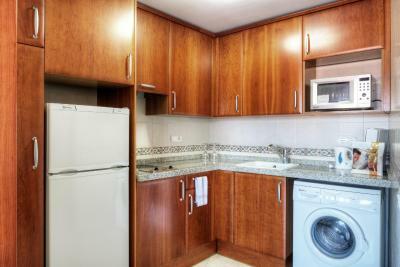 The apartments have modern kitchens with a hob, microwave and washing machine. 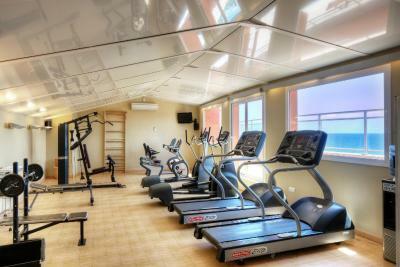 The Playa Golf has its own supermarket, and there is also a fitness center and a games room. Reception is open 24 hours a day. The Sunway Playa Golf and Spa has a spa and it offers a hamman, sauna and massages at an extra cost and an indoor pool with a hot tub free of charge. The Sunway Playa Golf and SPA complex has 3 restaurants offering a range of Mediterranean dishes. 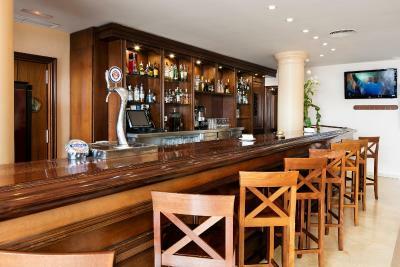 There is also a bar offering views over the Mediterranean Sea. Guests can use the hotel's free bicycles (subject to availability) to explore Sitges, with the town center a 10-minute ride away. 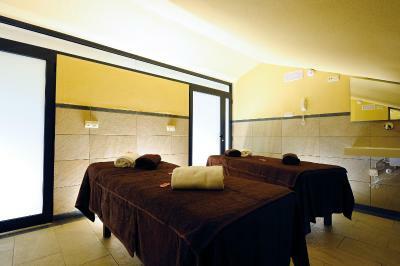 Barcelona can be reached easily by car, via the C32 motorway, or by train from Sitges station. When would you like to stay at Sunway Playa Golf & Spa Sitges? 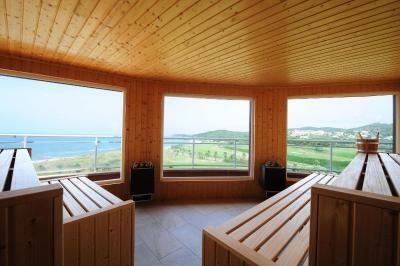 This room has a large terrace with views of the sea and golf course. This studio has a balcony overlooking the main pool. 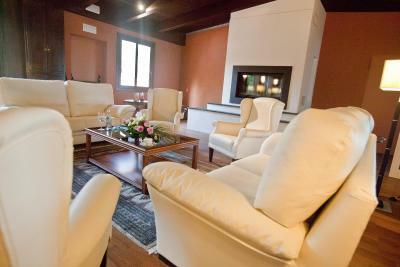 It has a large living room with a double bed and kitchen area. 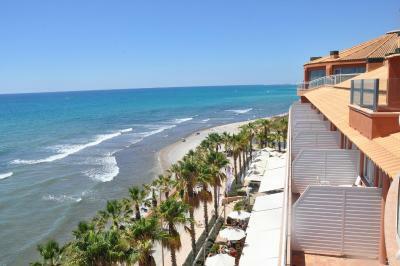 This apartment has 2 TVs and offers a balcony with views of the sea and the golf course. The bedroom is separated from the lounge area by a piece of furniture. There is a single sofa bed in the lounge and the apartment has a kitchen. Apartment with a balcony offering views of the main pool. There is a bedroom, kitchen area and living room with a double sofa bed. 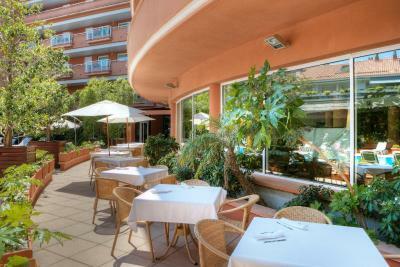 This air-conditioned family apartment features a large terrace with views of the sea and golf course. There is a double bedroom, separated from lounge by a piece of furniture. 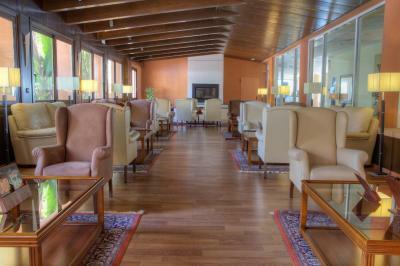 The lounge area has a flat-screen satellite TV and a double sofa bed. The kitchen includes a hob, microwave and coffee maker. 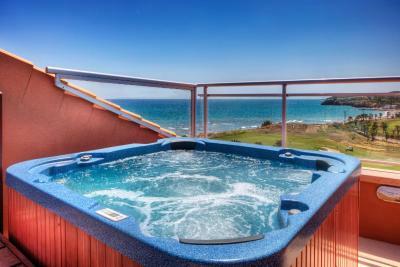 This suite features a large private terrace with great sea and golf course views. The kitchen includes a fridge. It has 1 double bedroom and 1 twin bedroom. 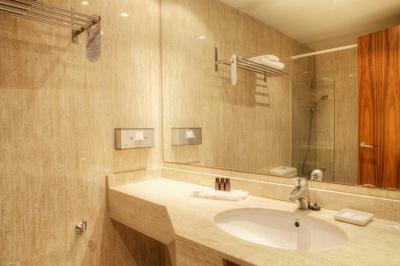 The bathroom comes with free toiletries, bath or shower, and hairdryer. This superior apartment has a terrace with views of the sea and the golf course. 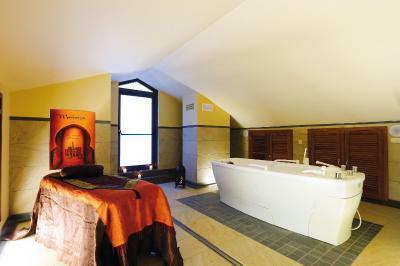 It also offers 1 double room and a fully equipped kitchen. 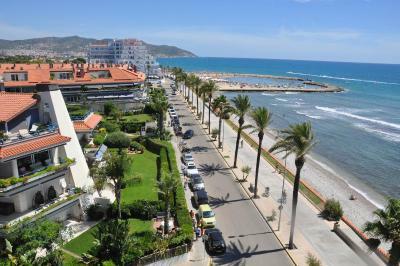 This apartment has a terrace with views of the Mediterranean sea and the golf course. 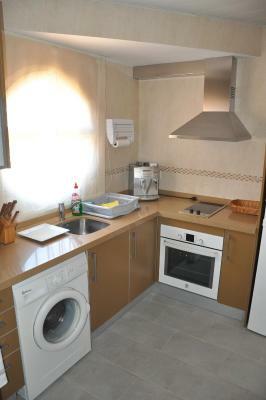 It also includes 1 twin room, 1 sofa bed, 2 TVs and a full kitchen with a microwave and a coffee machine. This suite has a balcony and dining area. The kitchen is fitted with a fridge, a toaster, and a microwave. An oven, a coffee machine, and a stovetop are also available. 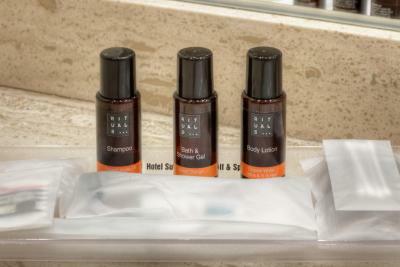 The bathroom comes with free toiletries, shower, and hairdryer. This suite features a balcony and seating area with a flat-screen TV. 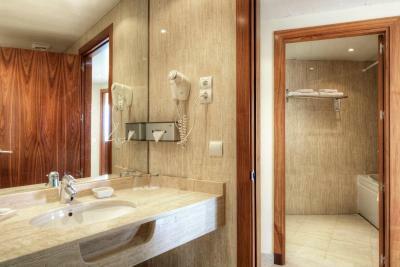 The bathroom comes with free toiletries, hot tub and hairdryer. 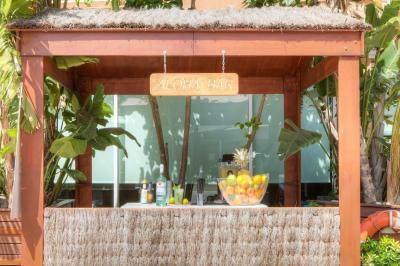 House Rules Sunway Playa Golf & Spa Sitges takes special requests – add in the next step! Sunway Playa Golf &amp; Spa Sitges accepts these cards and reserves the right to temporarily hold an amount prior to arrival. 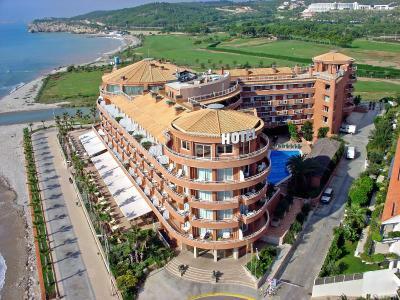 Sunway Playa Golf & Spa Sitges accepts these cards and reserves the right to temporarily hold an amount prior to arrival. 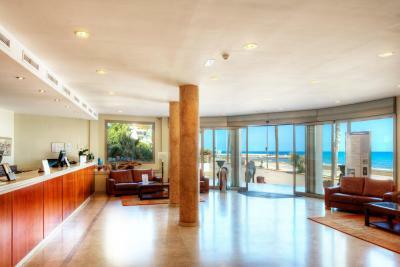 Great hotel, fabulous sea views from our studio, nice staff, decent breakfast, would definitely stay again! Great place, has everything you could need! Kathy the young lady who checked us in. The pool was amazing Wifi worked great A bit far from the center but quiet and free bicycles to ride anywhere!. Our only gripe was walking into the restaurant and being spoken to abruptly by the staff for sitting at a table which was reserved although no sign. We asked for a table for lunch and they said none available. The place was only half full. We wandered off and watched others walking in off the beach and just sitting at the tables, then insult to injury they were served!!! Now maybe because I didn’t tip them the night before when we arrived was the cause? We went to the hotel next door and had an amazing lunch and all further meals. Beautiful location, the hotel is very clean. The shut down electricity between 10 and 13 am. But then they shut it down in the lift while I was inside. I complained to the staff but they made no gesture. They prepared the room in several attempts although it was clear what had to be done from the beginning. Nice view on the sea. Restaurant not recommendable. Parking on site but not handy. Good climatization.